Just Listed! 55 N 13th St in Hawthorne – Ready to Move! Today The Zamir Group is proud to ring in the new year with a new listing! Newly renovated 55 N 13th St in Hawthorne is an amazing home in a prime location. Tons of JUST completed renovations on a big lot make this a move-in ready masterpiece that just needs you. It is also ready for a quick close. Why wait? Spend your 2017 in an amazing new home! After all the work done, this is a thoroughly modern space with great style, wonderful amenities, and plenty of space. This house also has a prime location near transportation, parks, shopping and more. Call Today to schedule a showing – This is a very special listing! Near Transportation, Parks and More! STUNNING, UPDATED HAWTHORNE HOME WITH MODERN FINISHES AND PRIME LOCATION. CHARMING COLONIAL ON A LARGE LOT WITH FRONT AND REAR PORCHES OFFER A CHANCE TO ENJOY YOUR SPACIOUS SIDE AND BACK YARD AND PLENTY OF FUNCTIONAL OUTDOOR SPACE. OPEN CONCEPT MAIN FLOOR WITH BIG LIVING ROOM FEATURING STUNNING NEW HARDWOOD AND CEILING FANS. THOROUGHLY MODERN EAT IN KITCHEN WITH STAINLESS STEEL APPLIANCES, GRANITE COUNTERS, TILE BACKSPLASH AND PLENTY OF SPACE TO SPREAD OUT AND COOK, EAT AND RELAX. FULL BATH ON MAIN FLOOR WITH MODERN FINISHES, ELEGANT TILE AND FULL TUB SHOWER. UPPER FLOOR FEATURES THREE SPACIOUS BEDROOMS, NEW FIXTURES, AND MORE BEAUTIFUL WOOD FLOORS. SECOND FULL BATH WITH NEW FIXTURES AND FINISHES. BASEMENT FEATURES NEW WATER HEATER, BOILER FRENCH DRAINS AND SUMP PUMP, AS WELL AS LAUNDRY HOOKUPS. RADIANT GAS HEAT. GREAT LOCATION NEAR PARKS AND TRANSPORTATION. AVAILABLE FOR QUICK CLOSE! Work With The Zamir Group Today! 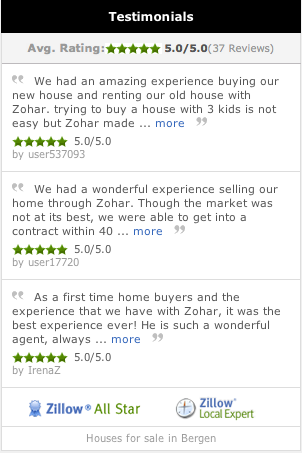 When You Hire Us, You Are Hiring More Than Just a Real Estate Agent. We Are a Team of Sales Associates, Buyer Specialists, Broker Associates and Realtors ® Backed by a Dedicated Operations and Marketing Team. Led By Zohar Zamir, a Top-Producing Broker Associate/Realtor ®, 5-Star Professional for 5 years (2013-2017) running, 2013-2015 NJAR® Circle of Excellence Sales Award®, PLATINUM Level #1 in Sales for the Entire NJMLS in 2016!– The Zamir Group is Bergen County’s Premier Real Estate Team. Contact Us Today to See This Amazing New Property, Our Many Other Great Listings, and to Get Bergen County, NJ’s Best Team On Your Side Today!